After the harsh winter we all experienced in New England, I think it is safe to assume we are all welcoming the recent signs of spring! For New England boat owners, spring is a season of promise and excitement as we begin to prepare for a fun-filled summer on the water. There is a long checklist of items on a boat that need tuning or replacement prior to the first excursion of the season. Some of these items include engines, hoses and fuel, batteries, as well as navigation and electrical systems. Oftentimes 'soft-good' items such as cushions, upholstery, mattresses and bedding go overlooked. 1. It is important to check your soft-good items for mold or mildew. Check the non-visible areas, such as the foam inside of a cushion, too. If you see spores or those small black spots, you have a mold problem and it is time to replace those cushions! Don't forget to check the items used in the exterior areas of the boat, such as deck or cockpit cushions, as they are often most susceptible to develop mold. 2. Mold and mildew aren't the only reasons to replace cushions or upholstery. After years of use, many upholstered pieces such as salon settees or driving seats will show signs of aging. Perhaps the foam has lost its form, the fabric is tearing, the vinyl/leather is cracked, or there are tears in the seams — it is time to invest in new upholstery. 3. Did you find your mattress to be less than comfortable for sleeping on last summer? If you spend a good amount of time aboard your boat overnight, consider investing in a new mattress. Many boats come off the production line with flimsy bunk cushions or stiff mattresses, which make for an uncomfortable night's sleep. Consider investing in a custom mattress which will provide you with years of comfortable use. An alternative option may be to purchase a custom mattress "pillow" topper which can act as a soft cushion atop a stiff mattress. 4. In addition to a good mattress, you should have a complete bedding set for your overnight cruises. Oftentimes boat mattresses are not standard sizes, they are custom in both size and shape to fit into the tight quarters of your stateroom. As a result, it is often difficult, if not impossible, to use an off-the-shelf sheet set or comforter on your bunk. Ordering custom bedding not only provides you with proper fitting linens, but also a custom, tailored look that meets your style and needs. 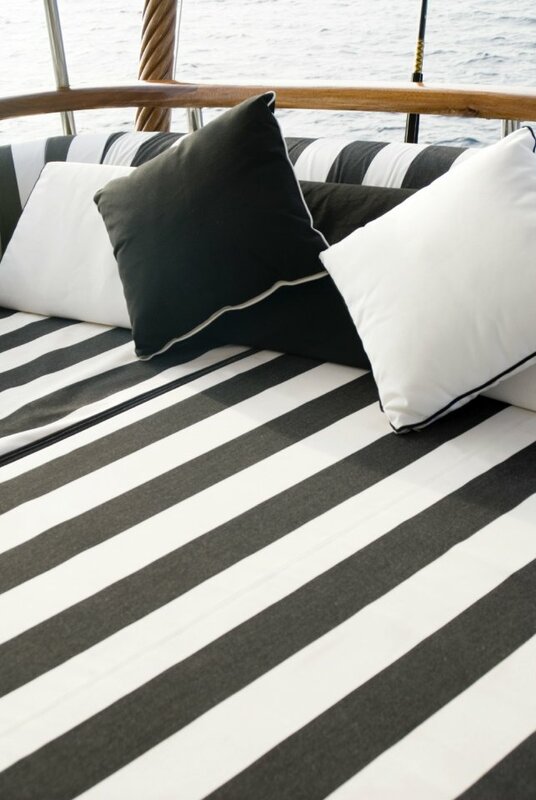 If you cruise for longer periods of time, purchase two sets of sheets so that you can switch out sheets while underway, without having to stop at a port to do laundry. 5. Be prepared to entertain aboard! Outfit your galley with the essentials to create an appealing table scape — melamine dinnerware, servingware, tumblers, and (plastic) wine glasses. Keep one or two hurricane lanterns with accompanying pillar candles aboard; they create nice lighting on the aft deck or in the cockpit. Throw pillows add warmth and comfort and can dress up any settee down below or or deck, so keep a few extra on hand to bring out when guests are aboard. For more information about Maloney Interiors and the services we provide, click here.